California Emergency Services Director Mark Ghilarducci said in a letter last week to the United States Forest Service that the federal agency has failed to reimburse local governments $18 million for fighting wildfires on federal lands last year. Ghilarducci claims the withheld money could bankrupt local agencies. “I cannot continue to support the deployment of resources to protect federal land that ultimately may bankrupt our local governments,” Ghilarducci wrote. The federal government is expected to reimburse local governments within two months, but more than 90 percent of payments from last year reportedly missed the deadline. In 2015, two thirds of payments were late. Ghilarducci said the federal government is wrongly relying on a “sudden interpretation” of a 1955 law that prevents the government from paying volunteer firefighters. More than a third of California’s firefighting force is comprised of volunteers. Under mutual aid agreements, local, state and federal firefighters collaborate to fight wildfires on federal land. Firefighters often travel hundreds of miles to battle the blazes. Nearly half of land in California is federally owned, much of which is concentrated in national forests. They need to resume spraying herbicide along the roads. 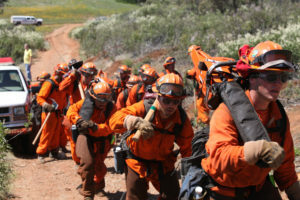 It’s interesting to see CCN use a picture of incarcerated fire fighters in this article (their red Nomax attire attests to that fact); fire fighters who are usually the best trained, most used in direct and indirect fire fighting, usually put into the most perilous situations and are most commonly the “first in” and “last out” professionals utilized, all the while not being paid what they’re worth. From what I was told while I was an incarcerated fire fighters with CDC (nope, not CDCR at the time) they would bill the state and feds minimum wage for our use and then pay us from $1.00 a day to $1.45 a day (depending on your job with your crew) and $1.00 an hour while fighting fires. I don’t know what it is today but I suspect it isn’t any different. The first thing that both the state and feds should do after getting their billing straitened out is consider paying those incarcerated men and women who put their well being on the line a real wage, one that may lead to being able to save enough money to effectively help them re-assimilate into society. I hope they don’t pay and California goes bankrupt we are moving anyway. I have got to laugh at this. The USFS has contracted Cal Fire to do their fire suppression then refuses to pay the bill. Just like the USFS taking fees for road maintenance then refusing to do the work. In some cases they just bladed the asphalt off the edge so that the dirt will be less traveled for less maintenance. Just consider the fact that we taxpayers are committed to fund their wages and pensions but there is no commitment that the public benefit will be provided. These facts, most are unaware of. If you are talking about someone taking fees for road maintenance and then not doing it, you will have to agree the State of California takes first place, they have been taking money for decades and wasting it, somewhere, but refuse to tell us exactly where, but we can guess salaries, benefits and pensions. The Feds disagree with California’s Pot Rules so they may tell California to just chill and charge more taxes for California Dreaming.